The 17th July 2007 was a very busy day. We had a deadline, and we made it (just), with payment systems going live at teatime; at 7pm that evening Seventh Wave was officially launched! These five years have been an incredible journey for the company, the staff, our customers and the health industry. We are very proud to be seeing tremendous growth year on year as we continue to bring the 100% natural and additive free Waveolution to the World. 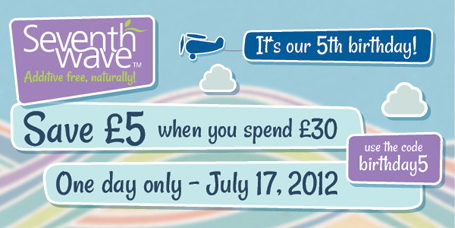 So for one day only, on Tuesday 17th July 2012, use the code birthday5 and you will save £5 when your basket is £30 or more. And the whole team would like to Thank you all for your continued custom, support and wonderful feedback; we look forward to helping you improve your health and vitality for many more years to come.